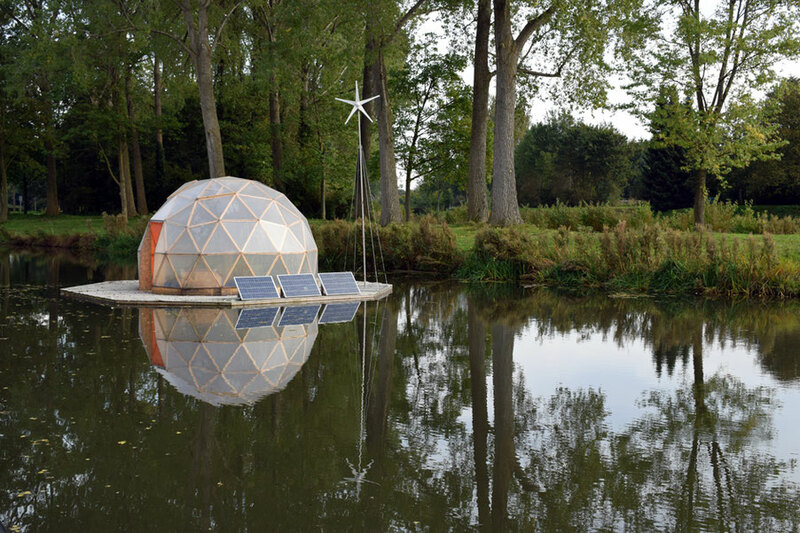 Ijssel Chinampa consists of a floating greenhouse in the shape of a geodesic dome, the dome is positionend on a raft situated on the Berkel river. Ijssel Chinampa is a floating sculptural work inspired from Azteec floating gardens called Chinampa. The Chinampas was a labor intensive, sustainible and a high yield cultivation method. Global warming, food production, sustainibility, agricultural history and urban gardening. When the audience meets Ijssel Chinampa they will see a floating sculptur on the river and they will be able through their smartphone to connect to the pictures crated with the surveillance camera intalled inside the dome. The surveillance camera monitors, the plants and the interior can be seen in time laps or as live stream. The Audience can access the artwork and both have a outside and a inside view at the same time. Inside the dome, traditional Aztec crops as corn, beans and squash are growing which are co-cultured by a method called “Three Sisters”. The crops are growing in a substrate made from earth, sand, peat and seaweed. Beside the ”Three Sisters” Amaranth, tomatoes, chili peppers, dahlias and potatoes are also growing inside the dome. This origin Aztec stapel food has found it´s way around the world and the most people in Europe consider the crops as a part of their own agricultural heritage. The watering of the plants is automated through a 12v water pump conected to the irrigation system for the plants. The electrical supply generates from wind and sun produced through wind mill and a solar panels. The electricity is stored in a battery placed on the raft for the supply of the survilence camera and the LED light what iluminates the dome at night time.